If you're in the DFW area, you're in luck! Small 4 Style is offering one lucky fan the opportunity to attend an exclusive fashion event at the Grapevine Mills shopping center in Grapevine, TX. Grapevine Mills is North Texas' ultimate shopping destination for steals and deals. As the winning fan, you will get the VIP treatment that premier bloggers get at fashion events like gift bags and front row seats! 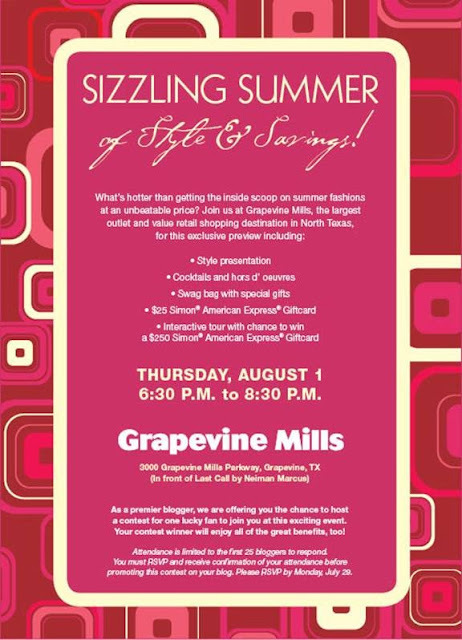 The Grapevine Mills events I have attended in the past were awesome, so I know this one is going to be great as well. Follow the steps below to enter to win! The event is on Thursday, 8/1/13 at 6:30. The contest ends on Sunday, 7/28/13 at midnight central time. The winner will be notified by email on 7/29/13, so make sure to include your email address when you leave your comment below!